Despite opposition and lawsuits, NYC’s Foam Ban on single-use foam products has gone into effect January 1st 2019. All food service establishments located or operating within the 5 Boroughs of NYC cannot, use, have, sell, or offer foam food service items. 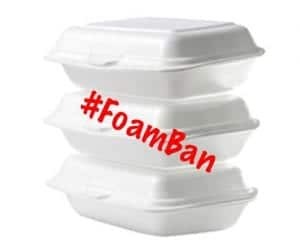 * Expanded polystyrene containers used for prepackaged food, filled and sealed before they were received. * Expanded polystyrene containers used to store raw meat, pork, fish, seafood or poultry sold from a butcher case or similar retail appliance. Alternatives to foam packaging include paper, plastic, aluminum and other biodegradable products. Contact your packaging distributor for details. Nonprofits and small businesses with revenue less than $500,000 in gross income could apply for hardship exemptions from The Department of Small Businesses Services (SBS). Although the ban is effective January 1st, 2019, businesses have a 6 month warning period lasting until June 30th. As of July 1st, fines will be issued to any business found in violation.